Electricity prices have been rising and show no signs of stopping. One way to combat high electricity bills is to find out which devices use the most electricity in your house or office. The Kill A Watt Electric Power Usage Meter is a gadget that allows you to see how much your refrigerator or Air Conditioner is costing you by measuring the amount of electricity it uses. With it you can find out how much it costs per day, week, month or year. You can even monitor the quality of your power because it will even show Voltage, Link Frequency and Power Factor. This is a very cool device. Basically you just plug it into the electric socket then plug in your electric device into the power usage meter. See picture above. 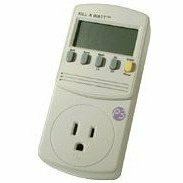 Using this device you will be able to pick apart your monthly electric bill appliance by appliance. I think you will also be surprised as to how much just leaving an appliance plugged in is costing you. Using this device you could even put a budget on things like your Air Conditioner. You could say you only want to spend $15 on AC this month and monitor it using this device. If you have an electric water heater or freezer it will also come in very handy. Refrigerators and freezers run inefficiently when they get older and at some point it makes sense to buy a new one based on electric usage. Now you will know with confidence when you should buy a new refrigerator or freezer. Also if you leave your computer on all the time now you can find out how much it really is costing you. See my Tip on How to Slash Your Tech Bills. The Kill A Watt Power Usage Meter is not exactly cheap, it costs around $35. One way to justify the cost is to think of it as an investment. If you are able to know the costs of certain devices and conserve energy then I think you could easily recoup your $35 pretty quickly. For more energy tips check out 100 Way to Improve Your Electric Bill.